2011 Billboard Music Awards Music Event Archive Photo from Photofeatures for Media use. 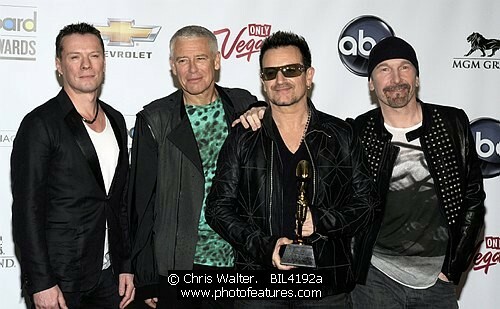 U2 Larry Mullen, Jr., Adam Clayton, Bono and The Edge at the 2011 Billboard Music Awards at the MGM Grand Arena in Las Vegas, May 22nd 2011. Note: This photo is copyright © Chris Walter and may not be used, printed or published without permission. 2011 Billboard Music Awards archive photos.